Wild Bird & Animal Foods. Cover Nets & Pest Control. Kits - Filter & Pump. 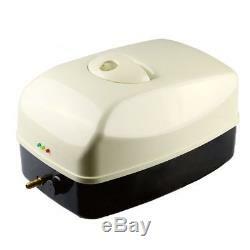 Cloverleaf CL-20 Pond Air Pump 65 LPM Aeration Automatic 8 Hour Battery Backup. Cloverleaf CL-20 Pond Air Pump 65 LPM Aeration With Automatic 8 Hour Battery Backup. Why Use an air pump All fish, aquatic plants and pond life require oxygen to remain healthy. Oxygen levels in your pond is especially important in warm weather and at night when plants need it, higher levels of oxygen are also required when you are treating your fish for disease as some treatments added to the pond can reduce the oxygen level. The Cloverleaf Air Pump sits external to the pond, you attach the airline to the outlet and put an air stone on the end and this is dropped into the water to increase the amount of oxygen in the pond and reduce carbon dioxide levels. Air pumps can also be used in Winter to prevent an area of the pond from freezing over and thus preventing the build-up of toxic gases which can be fatal. The pump should be protected from the frost if used in these circumstances. Pump includes manifold and one way air valve which should be used to prevent water syphoning back into the pump. Output: 65 litres per minute. Upto 8 hour battery backup in the event of a power failure. Includes outlet manifolds, non return valve, connections and hose clamps. Can be used in battery mode when transporting fish. Designed to run continuously with the minimum amount of maintenance. Dimensions: 350 x 215 x 195cm. PLEASE DO NOT SEND EMAILS to make changes to, or cancel an order as by the time we read it the goods will already have been dispatched. Orders where the weight is above 2 kg will have to be sent by courier at an additional charge, so please call before ordering to confirm what the charge will be. Please refer to the Post Codes below as these are what our courier considers Scottish Highlands or Two day parcel service (no NEXT DAY SERVICE available). Aberdeen - AB31-AB35; AB41-AB54 Argyll - FK17-FK21; KA28; PA20-PA78; PH30-PH31; PH34-PH44; PH49-PH99 Arran - KA27 Aviemore - PH22 Dundee - PH15-PH18 Fort William - PH33 Northern Highlands - AB36-AB38; AB55-AB56; HS1-HS9; KW0-KW14; PH19-PH29; PH32-PH33; PH45-PH48 Oban - PA34 Mallaig - PH41 Inverness - IV1-IV3, IV5, IV13, IV63 Beauly - IV4 Cromarty - IV11 Dingwall - IV15 Alness - IV17 Tain - IV19 Ullapool - IV26 Kyle of Lochalsh - IV40 Plockton - IV52. Order Cancellation/Changes: Once an order has been placed it will be processed immediately. Kettering Koi & ponds Ltd.
Any claims after this timescale may not be entertained. Before telephoning us please contact your local Post Office, as the most common reason for non receipt is that they are holding the parcel because they were unable to deliver it. Please first check the courier website for details, prior to telephoning us. Guarantee is in addition to and does not affect your statutory rights. The guarantee is available to the original purchaser only when accompanied with the original receipt. This guarantee is non transferable. The guarantee applies to the product only and does not cover any consequential losses. The guarantee applies to material and manufacturing defects only, under normal domestic use in the United Kingdom. The guarantee does not cover faults caused by factors outside the manufacturers control, including failure to follow the user guide and maintenance instructions, normal wear and tear, accidental or wilful misuse of the product, inappropriate storage methods and or inappropriate cleaning, modification or alteration of the product. The guarantee does not cover parts subject to normal wear and tear, for example pump impellers, filter sponges, air pump diaphragms, batteries etc. The guarantee does not cover glass items, for example aquarium heaters, uv quartz tubes and uv bulbs. Items offered Free are sent out as gifts to the customer and as such will not be covered by a guarantee. The guarantee does not cover maintenance issues including the replacement of wearable parts. Pond pumps and filters will require maintaining and cleaning over their lifetime. If you live in a hard water area it may be necessary to clean these items with a suitable lime scale remover (we recommend Superfish Pump Clean). Should an item develop a fault within its guarantee period, it may be sent back to Kettering Koi & Ponds Ltd. Repairs or replacement under the guarantee will be carried out as quickly as possible however you should allow up to 30 days for this. Faulty items will be tested and if a claim is made under this guarantee and the defect is not due to faulty materials or manufacture, or the product is found to be in working order, Kettering Koi & Ponds Ltd will return the product to the customer. Kettering Koi & Ponds Limited is an established business that has been trading since 1983 in Aquarium, Koi and Pond products. We stock an extensive range of goods for coldwater, tropical and marine aquariums, water gardening, goldfish and koi ponds as well as reptile equipment and pet products. We are stockists for all the major manufacturers including Aquarian, Blagdon, Exo Terra, Fish Mate, Fluval, Hagen, Hidom, Hikari, Hozelock, Interpet, Jebao, Komodo, Lotus, Nishikoi, Oasis, Superfish, Tetra, TMC, Waterlife, and Yamitsu (Kockney Koi). Distribution Warehouse: Kettering Koi & Ponds Ltd Unit 7 Orion Way Kettering Business Park Northants NN15 6NL Retail Shop: 63 Field Street Kettering Northants NN16 8EW Telephone 01536 515304 VAT Number: GB395 9384 85. This listing is currently undergoing maintenance, we apologise for any inconvenience caused. The item "Cloverleaf CL-20 Pond Air Pump 65 LPM Aeration Automatic 8 Hour Battery Backup" is in sale since Wednesday, May 11, 2016. This item is in the category "Pet Supplies\Fish & Aquarium\Air Pumps". The seller is "koi-and-ponds" and is located in Kettering, Northamptonshire.